JASkets Blog: First Project of 2012! I have learned a number of new stamping techniques this past fall. One of the really cool things I have added to my skill set is the use of Distress Inks and a blending tool. Basically a blending tool is a piece of foam sponge mounted to a wooden handle. You use the tool to create a blended antiqued or distressed looking edge to your paper and craft projects. I used this technique on my co-workers Christmas gifts this year. The little pieces of foam attach to the wooden handle with velco so you can change them for each color. For most projects you would use one or two colors so would want multiple blending tools. In my stash of "stuff" I had 4 or 5 cigar boxes full of vintage wooden stamp blocks and handles that my dad had gotten at a garage sale or auction and thought I could use them. All my stamps either were already mounted to blocks or were the clear cling kind that wouldn't stick to these. I just been sitting on them for the last 5 years or so. After trying a blending tool for the first time a light bulb went off in my head. I had finally found a use for my boxes of blocks! They were all of various sizes, a few were the right size, but most were not, so I had to cut them down and drill new holes for the handles. I had enough that I was able to make a tool for each color of Distress Ink I have. Well, with all these blending tools storage was becoming an issue. You can buy metal racks designed to hold these, but they don't hold that many. 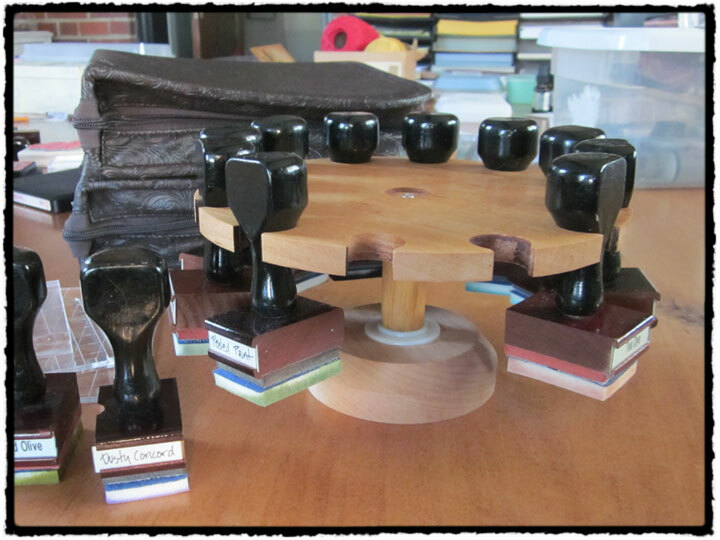 I would love to find a nice two tiered vintage stamp carousel, but that is going to take some estate sale scavenging. So, in the interim I decided that I would make a wooden version. After an initial failed attempt I made some adjustments and the above photo shows the results of my work. My goal is to add either another level or to make a second one since I have more tools than this one will hold. It isn't fancy, but it works and the wood is kind of pretty. Nice idea and work there. Saw your reply to Dawn and checked out your basket you made. And then see on your blog you're working with paper. Cool. I have been, too. Been recycling paper into handmade paper. And looking for ideas on using it. I like the distressed look, too. I actually came upon it accidentally. I used some leftover coffee in my paper mash and after it dried it was nicely brown all around. Funny how things happen like that. Anyway, I'll have to join up on your blog and keep up with your progress. Wouldn't a basket class (nearer to me!) by Dawn be nice? Awesome Job Man! It's a work of art in itself!